I finished a couple of knitting tasks at the weekend. My sister passed on two packets of yarn, each with a full ten skeins. She had purchased it at the Knitting and Stitching show in Dublin, last year. She did not like the feel of the yarn in her hands. It was not a yarn I would normally pick, but the challenge was how best to use it. I began with a crochet needle, but found it very difficult to actually see the stitches for the first row. I began again with a larger needle, it did not work. 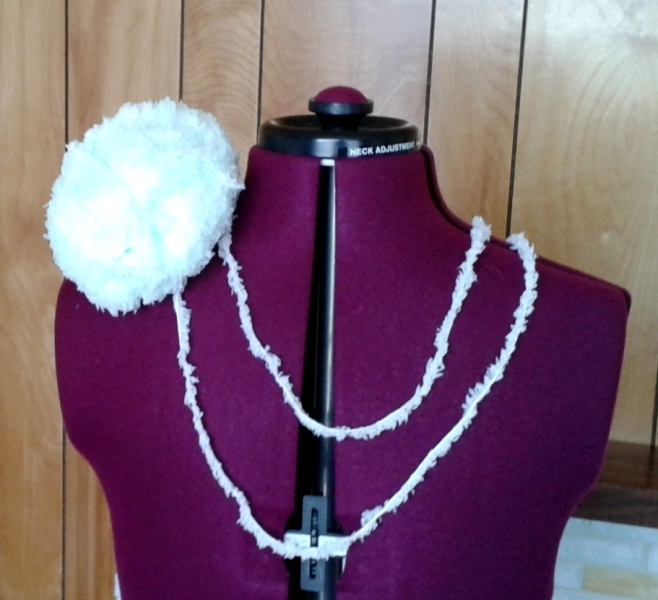 Then I tried knitting with the suggested size needle, but that did not work either. 😉 I could not find the stitches. It was like I was back in junior school all over again. Grrrr! I tried bamboo, plastic and metal needles, but they did not help because there was little contrast between the yarn and the needles.. At this rate, it would take me a year to knit a dozen rows and only in bright daylight. Bright daylight is for exploring the outside world and not sitting indoors knitting..
Knit Pro interchangeable needles and cables. 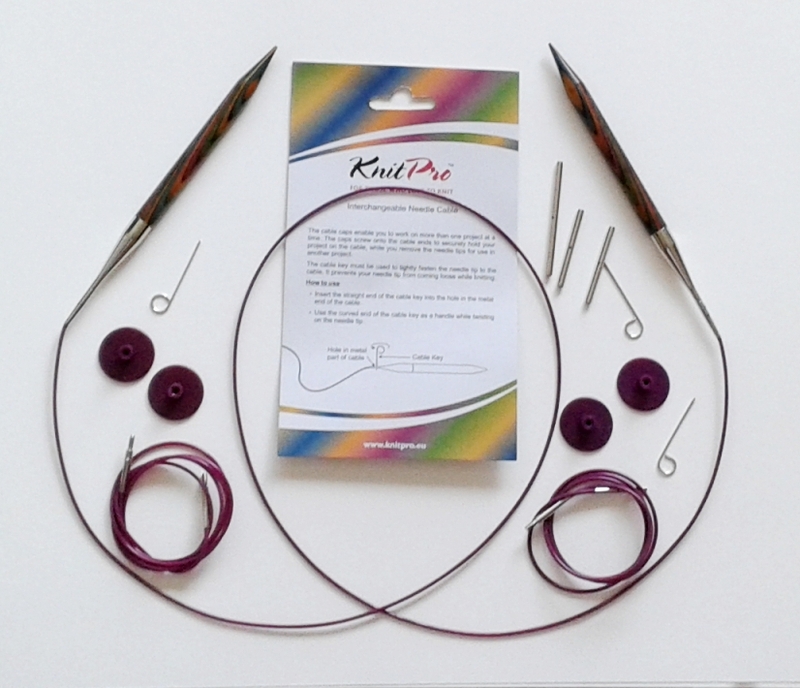 I would try my largest Knit Pro™ interchangeable needles. The needles are coloured and Bingo – I was away in a hack! I had no pattern, just an idea inside in my head, but when did that ever stop me? I knew what I wanted so decided to use the circular needles but knitting back and forward, I added extra cables as the number of stitches grew and was happy as a lark with the bundle growing to warm my knees on a couple of cool evenings. I wanted it knitted in one piece. It worked. The only seams were from the cuffs to the mid lower arms. It took five and a half skeins to complete. Not very different from the first one, but this time I used four skeins and a little of the already opened fifth one. The bulk in the base of the cape is a folded towel, there to hold out the garment so you can see the opening for hands. This one is cosy, but I think I prefer the first one! This entry was posted in Crafts and tagged Crafts, Knit Pro™ interchangeable needles, Knitted capes., Knitting on August 6, 2014 by Grannymar. They are. Since the yarn came from My sister, I will offer them to her, but maybe she will let me have one of them. The second bag of ten skeins is lemon and White. The colour is very subtle. I really like your creations tho – is the first one a really really large rectangle sew along two sides to form sleeves? You mentioned increases – were they along one side only? I did drop two stitches and the air was blue while I struggled to pick them up again. I too used the magnifying glass on a stand to help find them and placed a dark sheet of paper under the work. Eventually I sorted the problem. The first one – from my head – I began with about 120 stitches and increased by one at each end of the row until I reaches about 296 stitches, for the sleeves. We have very long arms in our family. Once there was enough to go round my wrists, I began to decrease (one stitch at each end) ever fourth row. It was a hit and miss idea, but somehow it worked. I joined the seams from cuff end for about 7/8 inches. and that was it. The second was 38 ins wide and 44 ins long. Folded in half. Leave 7 inches from the fold on each short side for the armholes, and stitch the last fifteen inches left to form a seam on each arm. I hope that sounds helpful, Cathy. The first one is my fave too. Nancy, the colour is very subtle and the garment is real cosy, just right for our winter evenings. How gorgeous! You are so talented! Awesome. This is a great example of making lemonade from lemons. How talented you are! I hate seeing things going to waste and love a challenge. This one took several false starts before I found my way. Ep-derm silicone gel sheeting is the material Nicole will use. Lovely work GM you inspire me to get back into the knitting, neglected for far too long. Must pack a few bits for Ireland soon and restart. My fave is the first too. I was thinking about you earlier (that was me on the phone) I bought ‘a knitting book’ for my sister’s birthday, it is something you might be interested in. Very colourful and great diagrams and details. Beautiful. The first one is my #1. You are a wonder. Will look up the book, can’t have too many. Brighid, some picture craft books are like recipe books, you use them for one recipe and they spend years sitting on a shelf. This one has plenty of helpful information on techniques and stitches, It might be dog eared before it ever reaches Dublin…. I might have to go and buy another copy. You are so right, I have bunches of them that I’ve used just one pattern from. Of course it doesn’t help that I like learning crafts so there are many books on dozens of different things. Good to know this book has lots of useful info.